The rate at which people are denying God and things of the spirit these days is quite worrisome. Have you even observed that the words "God" and "Jesus" are now muted in movies on DSTV? It's that bad! 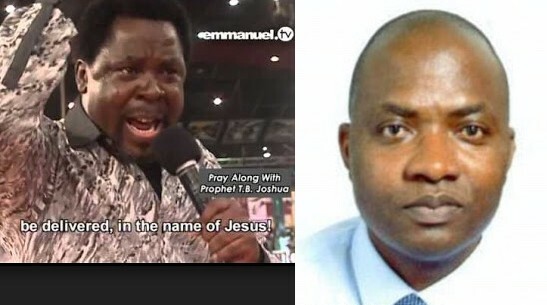 As you read this, a NHS psychiatrist in the United Kingdom, Dr Julius Awakame, has been sacked after he advised a patient to get help from TB Joshua's 24-hour church TV channel, Emmanuel TV because she might be possessed by demonic 'forces'. According to UK Daily Mail, Dr Julius recorded medical notes diagnosing the woman as having a history of 'satanic ritual abuse' and said her issues could not be addressed by regular treatment. The woman - known as Patient A - claimed Dr. Awakame also told her to get 'holy water' before 'switching off' during the consultation at a health centre in Harwich, Essex. When community psychiatric nurse Martin Rowe later quizzed Awkame whether she she was possessed, the medic replied: 'She may well be' and claimed she had been thrown out of her local church due to her condition. His employment with the North Essex Partnership Foundation Trust was terminated the following month. Today Dr. Awkame - who has since returned to his native Ghana - faced being struck off after he was found guilty in his absence at a medical tribunal of a number of misconduct charges. The consultation took place on January 23 2014 when Awakame was treating the vulnerable woman as an outpatient. The hearing, in Manchester, was told he was made aware she had a 'Dissociative Identity' - a personality disorder - and a 'history of previous satanic ritual abuse' before making a record of it in his notes. But Awakame, formerly of Ipswich, then told Patient A she had been 'initiated through satanic ritual' and wrote down a website address for her to access. And he said her problems 'could only be addressed by the church' before he wrote down the name and suggested she write a book about her experiences. He also told Patient A he had watched the TV station and said there were 'many people who had similar problems' to her. The patient further claimed Awakame told her to ask the church to send her some 'nice holy water' to help with her problems. She later spoke to Mr Rowe about the encounter and the nurse quizzed Awakame. The doctor also said he 'studied' the TV station 'for hours' and said the woman's church had recognised she was possessed and had thrown her out. Speaking of her emotional state following the meeting, Patient A said: 'I had pretty much switched off after hearing Dr Awakame tell me that no psychiatrist or psychologist could help me as throughout my childhood my parents had told me that no one would believe me and no one would help me'. Awakame was reported to a consultant psychiatrist at the Trust by Mr Rowe the day after the consultation. Following an investigation he was subsequently sacked and referred to the General Medical Council. Awakame, who worked in various hospitals in the NHS from 1997 to 2014, will be disciplined next month by the Medical Practitioners Tribunal Service. He is currently working as a lecturer in 'health informatics' in his home country where he graduated in medicine in 1993. WOW! Have You Seen Mark Zuckerberg's Wardrobe? Who kills the swag? Black guy or white guy?